In stock -This product will ship today if ordered within the next 8 hours and 18 minutes. 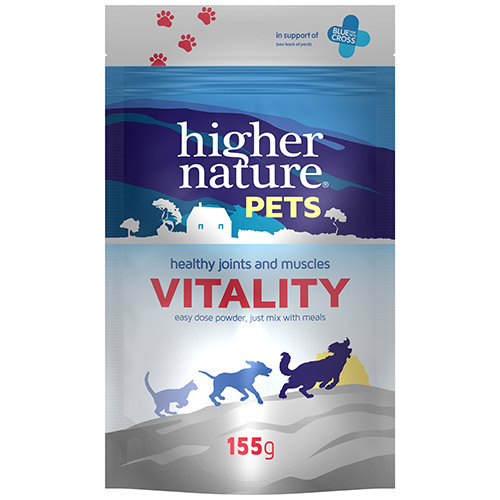 The Higher Nature Pets Vitality is a complete formula to keep your cats and dogs flexible and active. Formulated with joint supportive nutrients to help keep them running and jumping. Ideal for older pets and working or active pets. An easy dose powder, just mix with meals. The Pets Vitality also contains green lipped mussel powder, a natural source of omega 3`s and other joint-loving nutrients. It also contains glucosamine hydrochloride and chondroitin for joint support, manganese for normal bones and connective tissue and MSM to support flexible joints. Rice flour, glucosamine hydrochloride, methyl sulphonyl methane (MSM), green lipped mussel powder, chondroitin sulphate, manganese sulphate. Take once a day, sprinkle over or mix into food. For fussy eaters can be mixed with your pet`s favourite treat. If using for the first time, give double the dose for the first 6 week. Cats and very small dogs up to 5kg: ½ tsp per day. 90 servings. Small dogs 6-15kg: ¾ tsp per day. 90 servings. Very large dogs over 45kg: 2 tsp per day. 22 servings. Not advisable during pregnancy and lactation or if taking blood thinners such as warfarin. 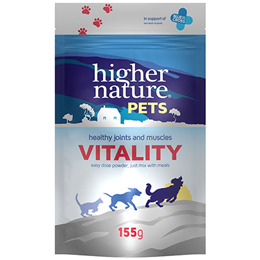 Below are reviews of Higher Nature Pets Vitality - Joints & Muscles - 155g by bodykind customers. If you have tried this product we'd love to hear what you think so please leave a review.